Mexican Dresses - Handmade Masterpieces crafted by Mexican Indigenous Groups - Hand Embroidered dress "Primavera C"
Ivory Mexican dress with hand embroidered multicolored embroidery accent. Loose construction for an airy feeling 100% Cotton, even the lace is made of cotton. Artisan made. <**Size**>: One size, fits comfortably US-Women Size 4-8 <**Flat Measurements**>> Bust 20 in. Length 36 in. PLEASE, CHOOSE the embroidery your like: 1, 2, 3, 4 or 5 Custom Orders are welcome. MADE IN: Oaxaca, México. Artisans: Q. Family. 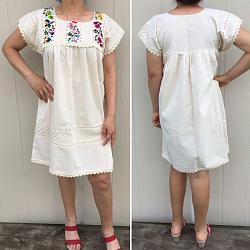 Currently viewing:Mexican Dresses - Handmade Masterpieces crafted by Mexican Indigenous Groups - Hand Embroidered dress "Primavera C"
Two Piece Mexican Outfit "Campesina B"
Two Piece Mexican Outfit "Campesina G"
Two Piece Mexican Outfit "Campesina A"
Two Piece Mexican Outfit "Perla"
Two Piece Mexican Outfit "Fiori"